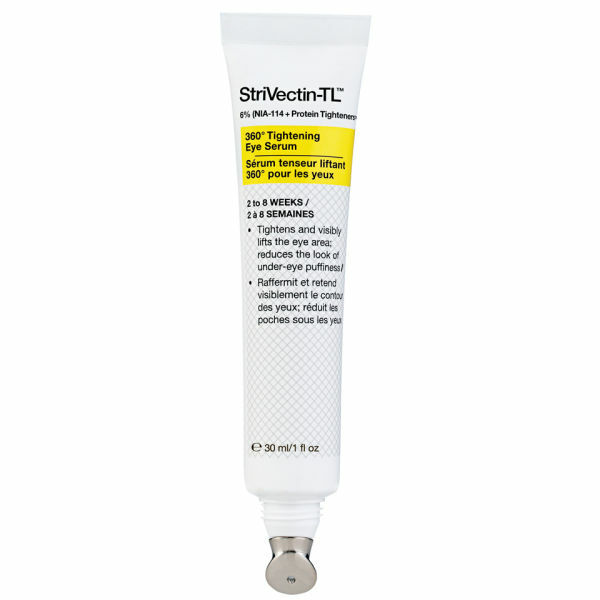 StriVectin TL™ 360° Eye Serum has been developed to visibly tighten and firm the skin's surface, whilst remaining gentle to the delicate eye area. Specially formulated using the brand's patented NIA-114™ technology to shield skin from the impact of environmental aggressors and revitalise tired eyes by reducing puffiness and under-eye bags. The lightweight serum contains an effective combination of caffeine and peptides to awaken skin, revealing a healthy-looking, luminous complexion. 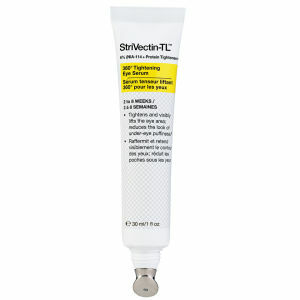 Its cooling metal tip gently massages skin during application to smoothen eye contours and restore vitality. E.N. Use AM and PM on cleansed skin. Gently glide cooling metal applicator around eye area – below eyes, at outer corners and over eyelid. Lightly pat excess with fingertip until absorbed. For an ultra-cooling effect, refrigerate prior to use. Aqua (Water, Eau), Glycerin, Dimethicone, Hydrolyzed Corn Starch, Myristyl Nicotinate, Pentaerythrityl Tetraethylhexanoate, C12-15 Alkyl Benzoate, Peg-40 Stearate, Propanediol, Ethylene/Acrylic Acid Copolymer, Hydrogenated Ethylhexyl Olivate, Pullulan, Jojoba Esters, Ammonium Acryloyldimethyltaurate/Vp Copolymer, Aloe Barbadensis Leaf Juice Powder, Hydrogenated Ethylhexyl Olivate, Sodium Hyaluronate, Caffeine, Resveratrol, Hesperidin Methyl Chalcone, Dipeptide-2, Palmitoyl Tripeptide-1, Palmitoyl Tetrapeptide-7, Palmitoyl Hexapeptide-12, Ceratonia Siliqua Gum, Algae Extract, Acrylamide/Sodium Acryloyldimethyltaurate Copolymer, Acryloyldimethyltaurate, Isohexadecane, Polysorbate 80, Hydrogenated Lecithin, Steareth-20, Parfum (Fragrance), Aminomethyl Propanol, Acrylates/C10-30 Alkyl Acrylate Crosspolymer, Disodium Edta, Ethylhexylglycerin, Chlorphensesin, Potassium Sorbate, Phenoxyethanol, Benzyl Alcohol, Chlorphenesin, Benzoic Acid, Benzyl Alcohol, BHT, Limonene.